Daisy Duck is one of Disney’s lesser known characters when compared to Donald or Minnie. Only in recent years has she become more popular, and she is often seen on Mickey’s Club House. Even though we don’t get to see Daisy that often, there are some lessons we can learn from her. Here are a few. Loyalty – Daisy is devoted to Donald Duck, and as his special friend, she remains loyal to him no matter what happens. Even if she gets angry with him, eventually, they make up. Then she is right by his side again. 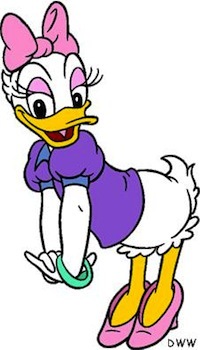 Responsibility – Daisy is the aunt of Huey, Dewey and Louie and she takes care of them from time to time. They can be quite a handful, but Daisy never shirks her duty as a caring auntie. Patience – For the most part Daisy displays patience, especially when Donald has one of his fits. Accept help from others – On an episode of Mickey’s Clubhouse, Daisy is trying to earn her “Pretend Doctor Sticker.” She gets stumped on some of the things she must do to earn her sticker, so she turns to Mickey for help. Little kids need to learn that it’s okay to accept help from others. They love doing things on their own, and that’s part of growing up, but accepting assistance from others when you need it is a smart thing to do. Be observant – In one show, Daisy is skiing down a mountain when she comes across Mickey and Pluto who are trying to find Goofy and Donald. They ask her if she’s seen any snow figures which are the clues to finding their friends. Fortunately Daisy was observant and saw the snow sculptures and pointed Mickey in the right direction. Pay attention to your surroundings. You never know when it may prove useful. Control your temper – Daisy Duck can lose her temper at times, but she is much better at controlling it then her friend Donald. Learning to control your temper can keep you out of trouble. Be willing to help others – At the Clubhouse, Daisy is always willing to lend a hand to her friends if they need assistance. With so many shows glorifying competition and the lack of cooperation, it’s refreshing to be able to point out when someone is being supportive. This is a valuable trait to develop. Don’t take advantage of friendship – In the short film “Daisy’s Big Sale,” Daisy takes advantage of her friendship with Minnie Mouse. Throughout the film, Daisy is bossy and insensitive to Minnie. Even though Minnie sticks by her friend to the end, Daisy pushes the bounds of the friendship. Teaching kids to appreciate their friend’s feelings and not take friendship for granted could make for more meaningful companionships down the road. Wait until you’re invited – It’s natural for kids to want to spend lots of time with their friends. However, kids need to learn that it’s impolite to invite yourself along rather than waiting to be invited. This point is wildly illustrated in the short film “Daisy’s Road Trip.” Kids watching this short will undoubtedly get the lesson. Don’t be jealous – In one movie, Daisy gets terribly jealous of Donald and her behavior gets way out of hand. Teaching kids how to handle their feelings and not let jealousy rule their actions is a lesson that can aid in keeping future relationships healthy. Daisy does have a lot of lessons to teach; some lessons come through positive messages and others come through behaviors that one should not emulate. To make TV time even more educational for your kids, watch the shows with them and share the messages you find.